This model is available as a 20% (1/5, 67 3/4" wingspan) scale or 18.1% (1/5.5, 59 1/2" wingspan) scale version. The Dalotel model has a very wide speed envelope, is easy to handle, and is very aerobatic. 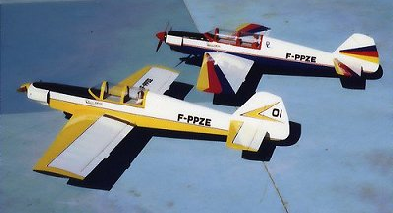 This model is suitable for Sport Scale, IMAC Scale Aerobatics, or Pattern competition. Design utilizes a midship fuel tank location, pull-pull cable rudder, and span wise variable airfoil design for excellent low speed handling characteristics. Construction is balsa, ply and spruce, and comes in at a weight of 7 1/2 or 6 1/2 lbs. ready to fly. 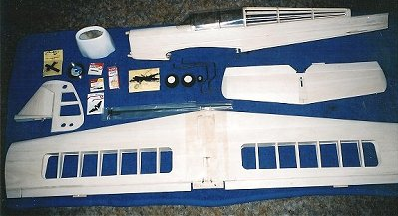 The plans come as three sheets, showing all details required to build the model. Also supplied with the plans are 24 black & white xeroxed photos of the various construction details and building notes. Fiber glass cowls are available. Model requires a four or five channel radio driving 4 servos, five with retracts (1/5) model. ARC model comes with pre-assembled wing, tail and fuselage ready to cover, and includes a fiberglass cowl, moulded canopy, landing gear, wheels, and hardware. The ready-to-cover version of the 20% scale Dalotel is handcrafted by Wilfredo Martinez in Puerto Rico from D&L Designs plans. Plan price includes shipping. Call or EMAIL for ARC or ARF shipping costs. The ready-to-cover version of the 18.1% Dalotel is handcrafted in Guangxi China from D&L Designs plans by the Chang hang Model Factory. The almost-ready-to-fly version of the Dalotel is handcrafted in Guangxi, China from D&L Designs plans by the Chang hang Model Factory. 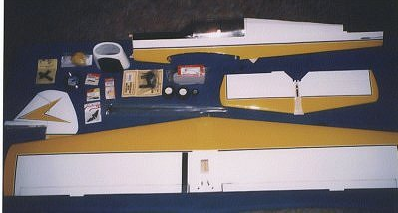 ARF model comes pre-finished with iron on covering, painted cowl, hardware, fuel tank, motor mount, spinner and decals. Yellow, red, blue and white (airshow color scheme).